Mono progressing cavity pumps are helping to manage 12 000 tonnes of material each year at a major waste recycling plant in the UK. NOV has provided a pair of Mono progressing cavity pumps to help manage 12 000 tonnes of material each year, including 7500 tonnes of food waste, at a major waste recycling plant in Weston-super-Mare, UK. An EZstrip transfer pump and a Compact C range pump have been installed as part of an Anaerobic Digestion (AD) process operated by the waste management company, Cory Environmental. Three other EZstrip pumps have previously been installed in other parts of this plant. 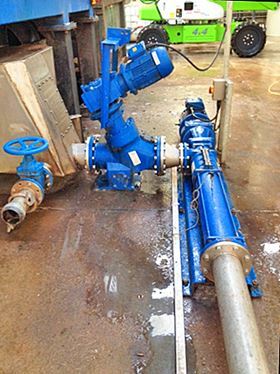 “Our existing Mono equipment from NOV had performed well, and that was a major factor in our decision to use two additional Mono pumps to handle the depackaged organics which go into our AD process. This is mainly food waste which can by quite aggressive on the rotors and stators of any pumps involved, so it was also important that we chose equipment that we knew would deliver in this sort of demanding application,” said Alistair Holl, director of Cory Environmental Resource Management. NOV’s unique EZstrip design reduces the typical day-long PC pump maintenance operation to just 30 minutes. ”The time and cost savings that the EZstrip design offers were also major considerations in our decision to use NOV again,” added Holl. NOV has provided a pair of Mono progressing cavity pumps which are now helping to manage 12 000 tonnes of material each year, including 7500 tonnes of food waste, at a major waste recycling plant in Weston-super-Mare, UK.